While most people are rejoicing over the arrival of spring, allergy sufferers know that with the warmer weather also comes sniffling, sneezing, and itchy eyes. 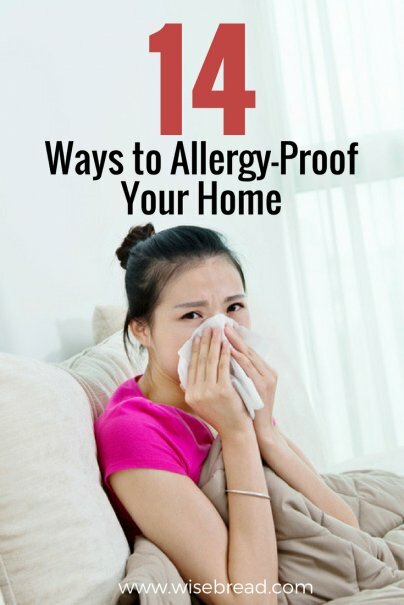 Even though you won't be able to avoid all allergens, there are several ways to allergy-proof your home in order to keep the sneezing to a minimum. Use two doormats, one outside and one right inside the front door to catch any pollen and other allergens hanging onto our shoes. Better yet, make your home a shoe-free zone and make a habit of taking off your shoes as soon as you come home. Upgrade your sheets, pillows, pillowcases, duvets, and comforters to hypoallergenic versions. If you can't afford to replace all of your bedding at once, start with the pillowcases, since those are the closest to your face when you sleep. Your laundry detergent could cause allergy flare-ups, too, so wash with unscented soaps. Clean or replace your home's air filters every 90 days if you are a pet-free home or every 60 days if you have a dog or cat. If you have more than one pet, clean or replace the air filters every 20-45 days. Pet fur and dander cling to these easily, and could be the cause of increased allergic reactions. A good air purifier will cost you between $50-$100, but it is a worthwhile investment. Keep one in your room, your kid's room, and in the main living area. Remember to clean the filters and wipe down the unit every month or two to ensure the unit stays effective. The difference between air purifiers and humidifiers is that the former clears smoke, dust, pollen, pet dander, and other allergens from the indoor air without adding moisture, and the latter adds water to the air, without cleaning it. In order to keep allergic reactions at bay, it's helpful to have both in your home. If indoor air becomes too dry, allergies and respiratory issues can be triggered. If the air has too much moisture, you risk the spread of dust and mold. Humidifiers should be cleaned once a week in order to prevent dust and mold buildup. So while it's a delicate balance, it's worth it to keep a humidifier nearby to the prevent sneezing fits, sore throats, and runny noses that are common during allergy season. Humidifiers are also extremely affordable, running you anywhere from $15–$50, depending on the size and model. While curtains and drapes can make a room look stylish and cozy, they can also harbor a lot of dust mites and other common allergens. Consider ditching the curtains altogether, or wash them in hot water every few months to remove allergens. Kids' stuffed animals can be major magnets for dust mites. Be sure to wash them regularly and don't be afraid to give a sweet teddy the boot (or replace it with a new one if your child is particularly attached) if it looks past its prime. This might not be in everyone's budget or realistic for everyone's lifestyle, but it could be highly beneficial for allergy sufferers, especially those who live in older homes. Your carpet might be the source of many of your allergy problems, especially if it has lived through another owner or two. Getting the carpets cleaned can help, but it doesn't eliminate the allergy problem like replacing carpets for hard floors does. Getting long-haired pets trimmed or shaved for the spring and summer months can cut down on shedding, and reduce unwanted allergens in your home. If your pet can't rock a shaved look, give them baths regularly in the warmer months and brush out their fur outside. It's important to dust regularly, but dusting the wrong way can make particles fly up into the air and aggravate your sinuses. Instead, use a damp cloth or a Swiffer duster that captures the dust molecules instead of spreading them. A vacuum with a high-efficiency particulate air (HEPA) filter is extremely effective at removing small dust particles from your home. Vacuum carpets and furniture once or twice a week, and change the HEPA filter according to your vacuum manual.